Tired of expensive AC bills in the summer and gas heating bills in the winter? Do you need a heat pump for your home’s HVAC system? Bryant Legacy Line of heat pumps is the ideal solution to all your heating and cooling needs – it is reliable, durable, efficient and saves. Bryant Legacy Line is ideal for the home, designed to work best in smaller areas and to help maintain a consistent temperature in your home all year round. Every single heat pump model in the Legacy Line comes with the Bryant Housewise Wi-Fi compatible thermostat. This feature is critical to your continued savings as you can manage the temperature while you are away. Anywhere you can get Wi-Fi, you can adjust the home temperature. Notice a heatwave coming while you’re out of town and worried about your pets or plants? With the Bryant Housewise thermostat, you can start cooling your home from anywhere in the world. Don’t leave it up to timers and sensors; you can take control of your home’s heating and cooling needs and have your home kept at the perfect temperature. With some of the best HVAC units on the market you would expect a warranty to match and you would be right. Bryant Heat Pumps come with a 10 year parts warranty. 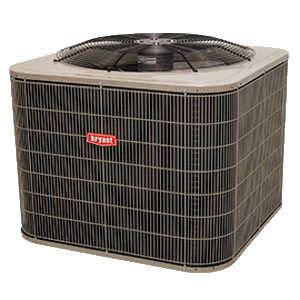 This 10 year warranty serves as a testament to the quality of the craftsmanship that goes into every HVAC model that Bryant produces and ensures you get the highest quality heat pumps available. Get the best cooling available in the series with the Bryant Legacy Line 215B. This heat pump has the highest Seasonal Energy Efficiency Ratio in the series with a rating of up to 15 and an Energy Efficiency Ratio of 12. Not only is the 215B exceptionally good at cooling your home, this HVAC also offers one of the most efficient heating systems in the Legacy series as well. With an HSPF rating of 8.5 you are ensured high-quality, low cost heating for your home even in the winter months using affordable electric heat. Bryant Legacy 214D has an additional benefit over others in this line, its low noise level. The 214D is one of the quietest heat pump units in the Legacy Line. With a noise level of 69 decibels, about the same noise as the average vacuum cleaner, the 214D is sure to provide you maximum comfort at minimum noise. What’s better than wondering if your heat pump needs some maintenance work done? A thermostat that will tell you. The 214D is equipped with the Bryant Housewise thermostat that will send you maintenance reminders as well as service alerts so you can have peace of mind that your heat pump is working at its peak. If you live in a corrosion prone area then the 214DNC is the model of choice for you to protect your heat pump. Covered in a special corrosion-resistant coating, the 214DNC is ideal to withstand the harsh sea air and corrosive effects of the wind and waves. However, this epoxy coating is not its only defense, its entire outer case is shielded by sheet metal construction and a powder paint job baked onto its surface. With multiple layers of protection, the 214DNC is the most durable HVAC model in the series for harsh conditions. It also provides you with 14 SEER and 8.2 HSPF for added comfort in any season. Bryant Legacy 213C has a SEER rating of up to 13 and a HSPF rating of up to 7.7, but perhaps even more than that, it is Hybrid Heat system capable. This means that for the winter months when you are heating your house, the 213C heat pump can be installed to work together with an existing furnace, or you can have your HVAC dealer install a new high-efficiency furnace from Bryant. This hybrid heating system is ideal for helping to keep your heating costs low during the winter months by being more energy efficient. Whether you live in a coastal community or inland, the Bryant Legacy Line of heat pumps is ideal for heating and cooling a home year round.